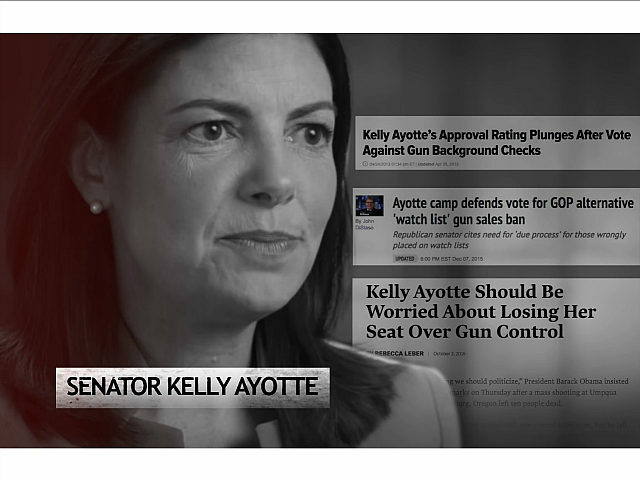 Gabby Giffords’s gun control group — Americans for Responsible Solutions — is spending seven figures to air an ad against pro-gun Sen. Kelly Ayotte (R-NH). Ayotte opposed the expanded background checks legislation proposed by Sen. Joe Manchin (D-WV) in the wake of the Sandy Hook Elementary attack. But Gabby Giffords believes every would-be gun purchaser — private or retail — should have to pass the same background check her attacker, Jared Loughner, passed to acquire his gun. It is the same background check the San Bernardino attackers passed for their handguns, as well as the same check that Umpqua Community College attacker Chris Harper Mercer, Virginia gunman Vester Lee Flanagan, and alleged Lafayette gunman John Russell Houser all passed to acquire their guns. WMUR reports that the Giffords group paid a “seven-figure” sum to secure three weeks airtime for the ad “on New Hampshire broadcast and Boston broadcast television stations, and New Hampshire cable television stations.” Giffords’s group is rallying behind Ayotte’s gun control challenger, who happens to be current NH Governor Maggie Hassan (D). Although carrying a gun openly without a permit is legal in New Hampshire, in July 2015, Hassan vetoed a bill allowing concealed carry without a permit. Moms Demand Action — a national, Bloomberg-funded gun control group — urged her to veto the bill.